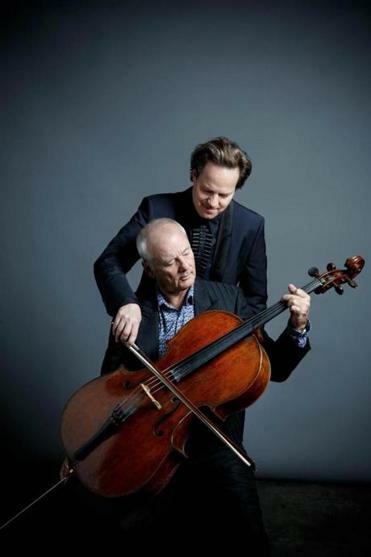 Classical cellist Jan Vogler and actor Bill Murray (seated) will play at the Orpheum and in Worcester this month. Q. Jan, your career is largely based around live performance, whereas Bill, it’s been some time since that’s been your lifeblood, I think since you left the cast of “Saturday Night Live” in 1980. What has it been like being in front of an audience on a regular basis again? Murray: It’s great being in front of an audience. You just don’t get that opportunity as much as you once did. When I first started, I was at the theater. The only job I had was being in front of live people. Getting into the movie business or the TV business, you don’t necessarily have a live audience. “Saturday Night Live” did have an audience, but movies, it’s quiet. You’ve just got a crew. So it’s a lot of fun. It’s a real joy. Q. The overarching theme of the entire project seems to be America and everything that that can mean. How did you end up grabbing onto that? Vogler: I basically feel like an immigrant. I grew up in East Germany, and when I first came to America to the Marlboro Music Festival, I saw the great immigrants and generations still alive who came from Europe and brought a lot of European culture to America. So I felt really invigorated by this, and I had read a lot of American literature and heard a lot of American music. So I think when Bill and I talked, we had this common interest in Americana. Q. The two of you met in an airport with neither of you knowing who the other was but striking up a conversation anyway. Do either of you recommend that as a method for artistic collaboration? Murray: Well, I guess yes, I would recommend it. I think if you get together with the intention of a collaboration, there’s a little bit of tension in your body and your mind, emotions when you sort of walk into it. But I think a sort of accidental free conversation lets you establish a human relationship, a way of behaving, a pattern of manners and respect. And the coincidence of the what if? — “What if we actually did something together?” — that certainly wasn’t in my mind even though I just knew a fellow was carrying a funny-shaped box aboard an airplane. I didn’t think to myself, “Oh, good. Here’s someone who can sit down while I stand up.” I don’t know. It was a nice accident. Q. How about you, Jan? Did you have any idea that when this American spoke to you about your cello that this would be happening? Q. When you were on “The Late Show with Stephen Colbert,” you had said that you watched “Stripes” for the first time with Bill essentially right next to you. What was that like? Murray: Yeah, it was a little unnerving, actually. He wasn’t really next to me. He was across the aisle. His cello had the window seat. He was on the aisle and I was on the aisle. But it’s true what he says. It was a nine-hour flight, and he was able to pause the film and fall asleep several times during the watching of “Stripes.” It took him about 5 1/2 hours to get through it. Vogler: [Laughs] That’s not true! Q. What movie was the cello watching? Vogler: Yeah, the cello is always the subject of envy, somehow, on the plane. Because Bill was thinking, “OK, this is first class and the cello is sitting on the window seat. Is that really fair, and does the cello deserve that?” But it’s a safety issue! If people have to leave the plane, they have to get out fast, so the cello has to sit on the window seat. Murray: It’s a little sadder than that. He’s actually talking to the cello, saying, “Hey, what’s it look like down there? What’s the weather doing?” And everyone has to ignore it. Interview has been edited and condensed. Marc Hirsh can be reached at officialmarc@gmail.com or on Twitter @spacecitymarc.